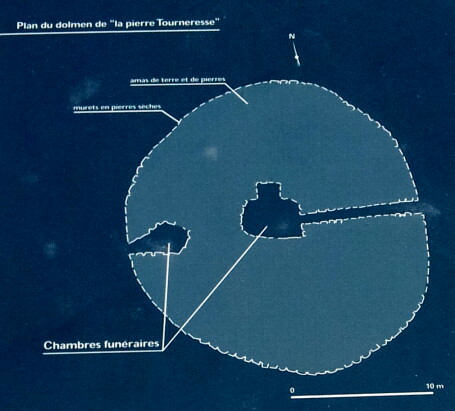 Pierre Tournesse is a megalithic structure dating back to 3,900 B.C. in the Neolithic era. 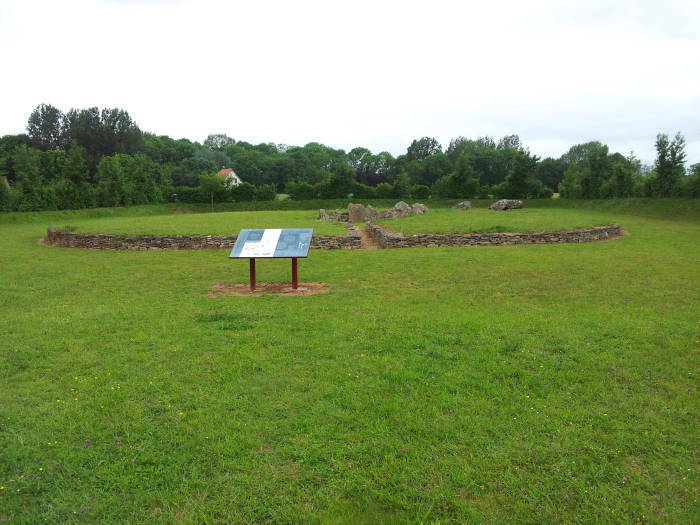 It is a passage grave, where the burial structure was buried under a mound of earth and was accessed through a tunnel. It is located on the north edge of the small town of Cairon, in the département of Calvados in Normandy, in northern France, near the city of Caen. You can easily visit it on your own. The people living here toward the end of the prehistoric period would have been settling down as agriculture was replacing the hunter-gatherer mobile lifestyle. 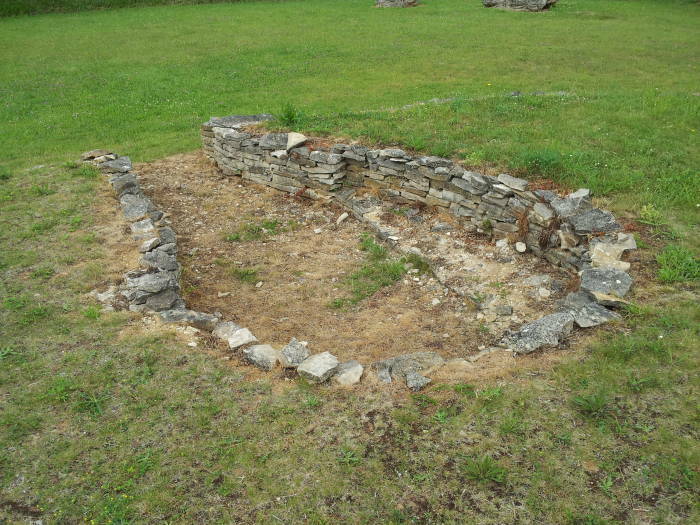 This allowed them to form communities and construct permanent structures like this burial complex. Until 1992, all that showed above the ground was a broad capstone surrounded by stone slabs. This suggested the presence of some sort of cairn. The town of Cairon acquired about a hectare of land centered on the site. Scientific excavations were carried out in 1996-1999, followed by partial reconstruction. These pictures show how one to two meters of soil had to be removed in order to expose the original structure. The site seems to be surrounded by a low berm, which is really just the slope up to the contemporary ground level. My parents, standing in the central chamber, and one of their friends standing near them provide a sense of scale. In the distance is our rental car, and beyond that are fertile wheat fields. The structure is built from limestone, all of it probably gathered from nearby. This dates from the Neolithic, the New Stone Age, so metal tools had not yet been developed (as would happen later in the Bronze Age, the Iron Age, and so on). Stone working and transport would have been difficult then. The plan on the marker shows how they constructed the tomb. The overall structure is nearly circular, about 24 meters in diameter. The low outer boundary wall is of drystone construction. That is, stones tightly fitted together but not mortared. The central chamber, about five by three meters in size, is close to the center of the structure. It had a small alcove on its north side. The central chamber was accessed by a corridor about eight to nine meters long and less than one meter wide and tall. The smaller chamber, about three by two meters, is more directly accessible from the exterior. Its entrance is on the opposite side from the long passage. 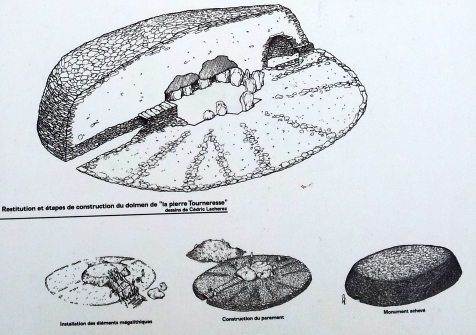 Another diagram on the sign shows the process of construction, across the bottom, and a cutaway of the finished structure, above. The central chamber was built as a dolmen with rows of large slabs and some drystone forming the walls and truly megalithic cover stones as a roof. The access tunnel was made with drystone walls and large slabs as a roof. The smaller chamber was built entirely of smaller stones in an igloo-like shape forming a corbelled vault. This assemblage was then buried in a mound mostly of earth with some stones, and the outer surface covered with stones. The smaller chamber may have built after the main structure was completed, by digging into the mound. The access passage is aligned to 100°, just a little south of due east. Maybe the orientation was significant to the builders, with the sunrise shining down the passageway on an auspicious day of the year. No one knows, this was a truly prehistoric era and so we have no recorded information about their beliefs. 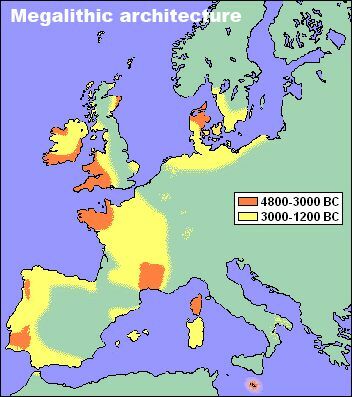 The Neolithic was the end of prehistoric time, when agriculture was being established and replacing mobile hunting and gathering. Human groups could settle and form small communities, domesticating animals and raising crops. The formation of communities allowed the construction of significant permanent structures like this one. The remains of at least twelve individuals, a few of them children, were found in the central burial chamber. It was carbon-14 dating on these remains that allowed the dating of the structure to 3,900—3,700 B.C. The entry passage walls were all drystone construction with small stones. The main chamber walls were partly built from large stones, with small drystone walls filling the gaps. Large slabs spanned the roof of the chamber. The smaller chamber held the body of one child wearing a necklace with a pieced dog tooth as a pendant. The smaller chamber is oriented with its central axis and opening aligned toward about 270°, roughly opposite the direction of the main passageway. The human remains and everything else found at the site are now at the national archaeological museum at Saint-Germain-en-Laye on the western outskirts of Paris. The broken pieces of the cover stones were not replaced on the central dolmen. 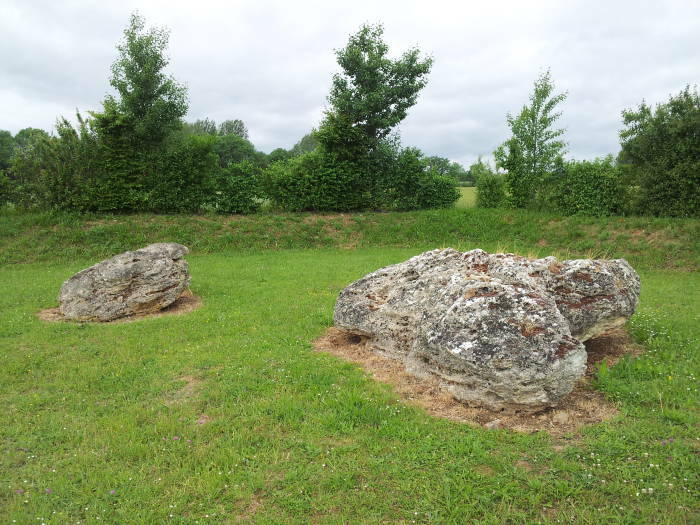 The Calvados département has a number of megaliths, many of them individual stones called menhirs especially in the case of standing stones. Many of them share a common legend about a large stone that can turn itself over. 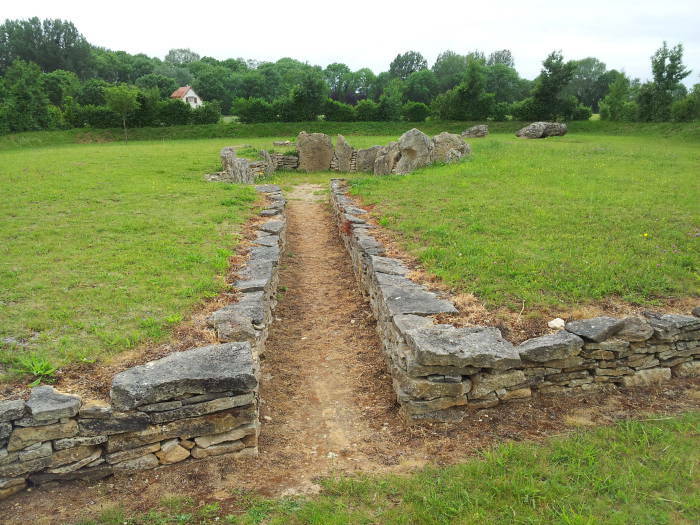 The name of this structure literally means "The Turning Stone" as tourner is French for turn. 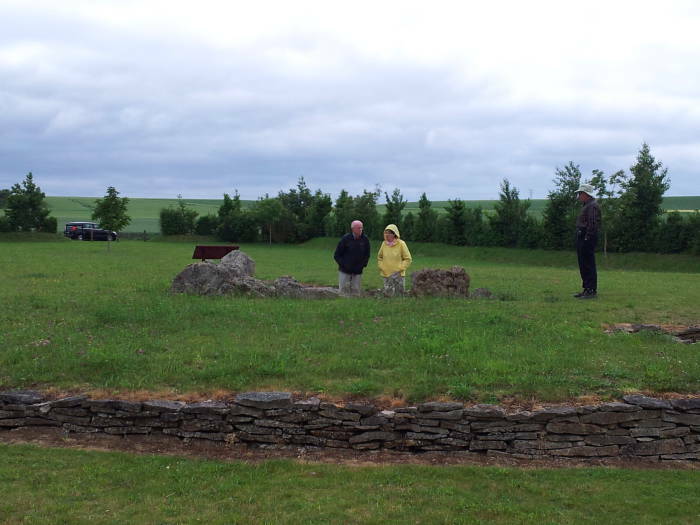 All that was visible and known about in historic time was the top of one or more of the capstones, and this was said to be one of the "turning stones". 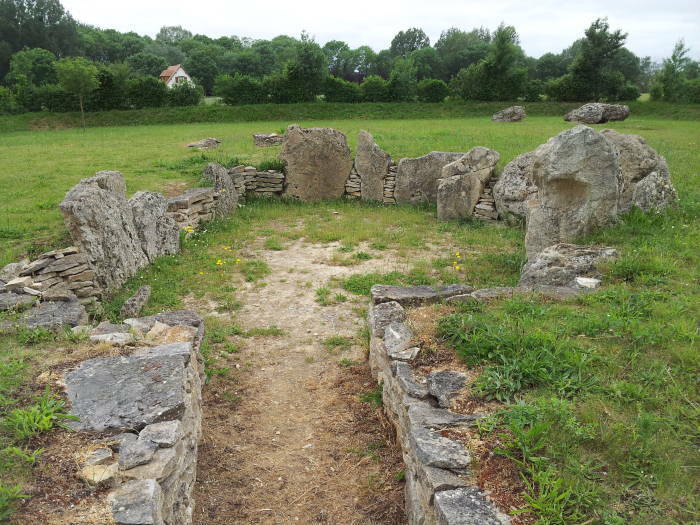 Other nearby similarly named sites are la Pierre Tourneresse à Gouvix, la Pierre Tournante à Fresney-le-Puceux, la Pierre Tournante à Livarot, and also a stone no longer to be found called la Pierre Tourniresse, once located between Thaon and Colomby-sur-Thaon. 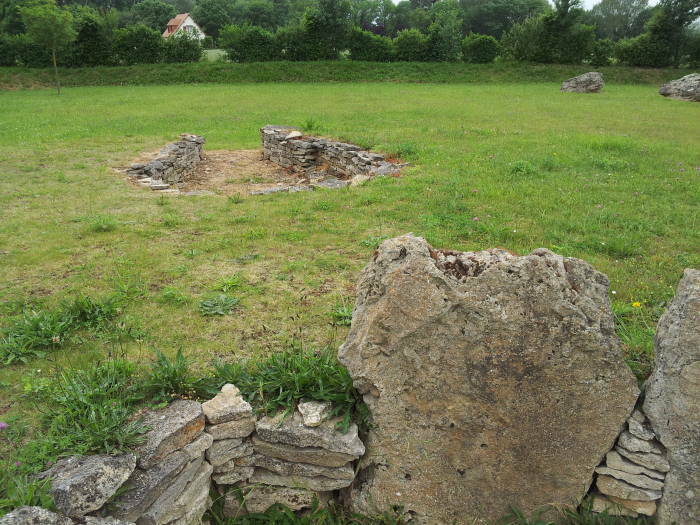 The Germans had used this site as a gun emplacement and shelter during World War II, using the exposed capstones as part of that. They destroyed their site as they withdrew in June, 1944, damaging the capstones in the process. Until then, the capstones were complete. A Würzburg radar site is nearby, and a visit there is easily combined with Pierre Tourneresse. Nazis and self-rotating megaliths, this sounds like a case for the Bureau for Paranormal Research and Defense. Take the D22 road northwest from the Caen ring road to Cairon. This may appear as Cairon-le-Vieux or "Cairon-the-Old" on some maps. Near the center of this town of about 1,600 people there is a small road leading north along the Vey, a small river flowing toward the Mue. Just before the highway passes a building with the local boulangerie et patisserie and crosses a small stream, Rue de la Cachette crosses the highway. A sign there points to the town's mairie, école, bibliothèque, and so on, all of that straight ahead on the D22, and a smaller sign points to the right to Pierre Tourneresse. Turn right! After the street intersection about 100 meters north of the D22, the lane curves to the left and then to the right as it follows the Vey. Along the way it turns into a farm lane, really just two tracks, continuing to the north. The lane is labeled as Chemin Nôtre Dame du Marais (or The Lane of Our Lady of the Swamp) on Google Maps. Pass the sign saying that no one except residents, bicycles, and agricultural equipment should continue back the lane. Rented cars surely fit into one of those categories, so keep going. About 500-600 meters north of the D22, turn sharply to your right and back and then continue about 400 meters back to the south. The site will be on your right. Here is a view to the north from that lane. 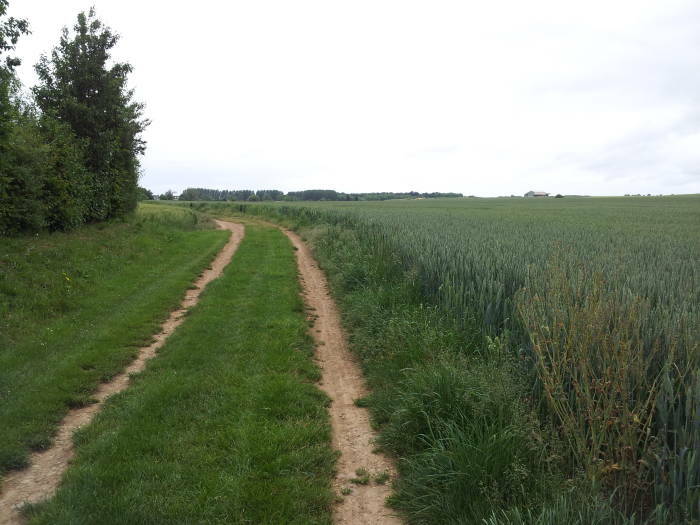 The lane passes between a wheat field to its east and the site on its west. From here you can continue on out to the D22. 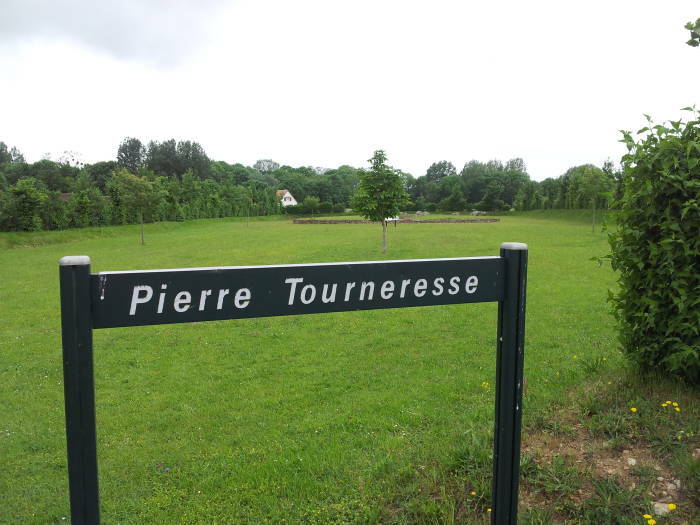 Alternatively, depending on your direction of travel, you might spot a sign for La Pierre Tourneresse on the D22 and see how to get there directly. The town of Cairon is mentioned in records from the year 1077, when it was spelled as Karon. It was mentioned as Cayron in 1231. The name is thought to come from the Roman name Carius suffixed with -onis. Since the Celtic word karn meant stone, it is possible that the town got its name indirectly from the exposed capstone. The town's nearby fortified Church of Saint-Hilaire was built on a low hill in the 13th century. It was a strategic point in the Hundred Years War, a series of conflicts between England and France from 1337 to 1453. Cairon was liberated from the German occupiers on 11 June 1944 by the 46th Royal Marine Commando.